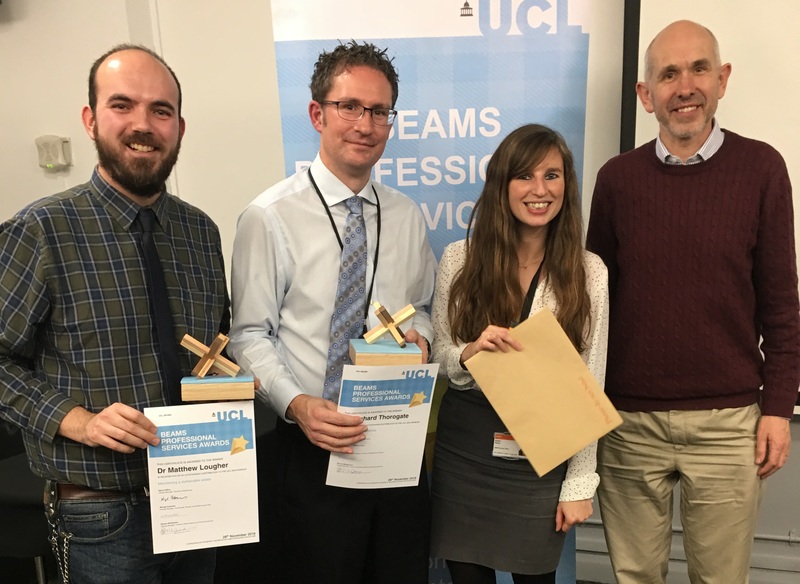 These awards were set up to recognise the positive attitude and commitment that individual professional services staff in BEAMS bring to their work and celebrate how they are contributing to the UCL 20034 enables. During this year, there were 77 nominations across the categories. Matt was awarded against the fifth enabler category, which is ‘maintaining a sustainable estate to meet our aspirations’. Within his role, Matt manages all operational aspects of a hazard group 2 (derogated hazard group 3) certified bio-nanotechnology laboratory including, but not limited to, maintaining equipment, arranging service visits, inducting new starters, providing machine training and ensuring compliance with health and safety requirements. During his time in the role, Matt has been committed to upholding the safety and organisation of the lab, as well as finding innovative ways to make the lab ‘greener.’ He has implemented better safety wear that is more fit to individual users, worked to refine systems and process, including storage, to make them more efficient and user friendly, and introduced new approaches to recycling plastics and cardboards. Beyond this, Matt has shown leadership by creating an LCN Departmental Laboratory Management Committee and taken on the responsibilities of the Department GM Safety Officer. Finally, within the group, Matt has created a new system for data management and storage.